Wipe the chicken, inside and out, with kitchen paper. Place in a flameproof roasting tray. Rub the chicken all over with the lemon juice. Season and smear the butter over its breast. 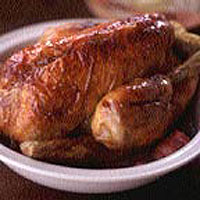 Roast in the centre of the oven for 30 minutes, then turn the bird on its side, so it is lying on one side of its breast. Roast for another 30 minutes, then turn on to the other breast and roast for another 20 minutes or until done. Turning the bird makes it much more succulent, as the juices run into the breast. It is cooked when the juices run clear when the thickest part of the thigh is pierced with a skewer. As soon as the bird is in the oven, start the accompaniments. To make the bread sauce, put the milk, clove-studded onion, bay leaf, nutmeg and peppercorns in a small pan. Heat until almost boiling, then remove from the heat and leave to infuse for 30 minutes. While the milk is infusing, prepare the bacon rolls by cutting each streaky bacon rasher in half and rolling up each piece tightly. Put these bacon rolls in a small roasting pan and place in the oven 30 minutes before the chicken has finished cooking. To finish the bread sauce, strain the milk into a clean pan and reheat with the butter and cream. Whisk in the breadcrumbs over a low heat and stir occasionally until the sauce has thickened (about 10 minutes). Season to taste. Transfer the cooked chicken to a serving dish and leave to rest in a warm place while you make the gravy. Pour off the excess fat from the roasting pan, leaving about 1 tbsp fat. Stir in the flour and cook for 1 minute. Pour in the wine and stir until it is absorbed into the flour and nearly evaporated, then add the stock. Boil vigorously, scraping the pan to loosen any bits of caramelised chicken. Boil until the stock has reduced to a rich gravy (about 10 minutes). Season and strain into a gravy boat. Carve the chicken and serve with the gravy, bread sauce and bacon rolls.